Republicans warned that Obamacare would kill jobs across the entire economy. Instead, 11 million jobs have been created since Obamacare passed. But Republicans also warned that Obamacare would “ruin the best health care system in the world.” Job growth doesn’t speak to quality of care, but it does suggest that an industry can thrive while being more tightly regulated. The 356,000 increase in health care jobs can’t solely be attributed to Obamacare, the health care sector was growing before Obamacare passed. But passage didn’t interrupt it’s growth. Still, the second biggest factor in the recent health care job explosion is hospital jobs, accounting for 70,000. 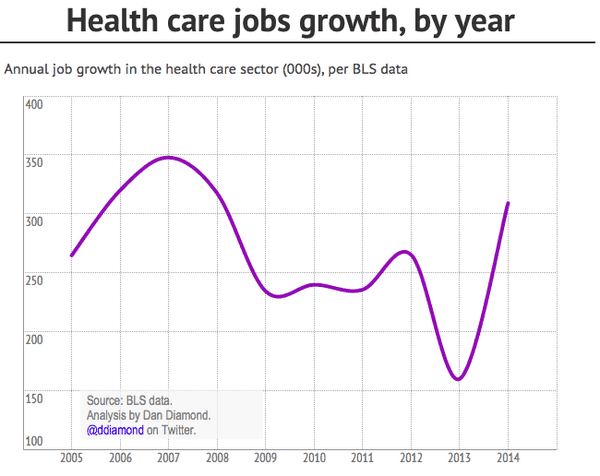 And as one economist explained to Diamond in an interview before the recent jobs report, “expansions in coverage have led to reductions in uncompensated care for hospitals”, a potential factor in improving hospital bottom lines and job creation. At minimum, there’s no serious argument to make that Obamacare has killed jobs or damaged the health care industry. We can expand health coverage while growing the economy and bolstering the health care industry. And we did.